April 27, 2017, 2:53 p.m.
UKIP leader Paul Nuttall has faced criticism following the party’s announcement that their general election manifesto would contain a pledge to ban face coverings in public places. The proposed ban prompted the resignation of several senior UKIP members and many were confused about the specifics of the policy, with the British Beekeepers Association requesting clarification about whether it would affect the protective outfits its members wear. However, the policy has nevertheless tended to be popular amongst the British public. 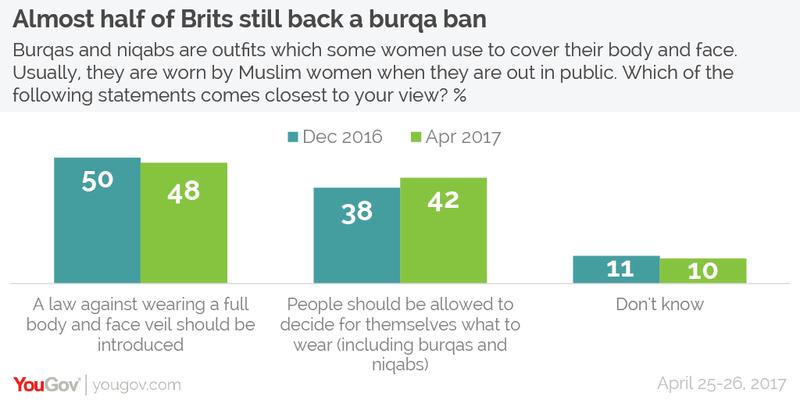 Results from a new YouGov/Times survey show that almost half (48%) would support a law against wearing a full body and face veil. By contrast, 42% say people should be allowed to decide for themselves what to wear. This gap has narrowed ever so slightly since this question was previously asked in December, when 50% of people supported a ban compared to 38% who opposed.